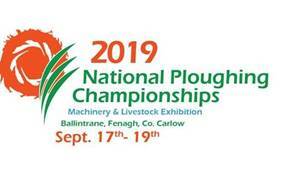 There was a massive crowd at the first packed public meeting to plan ahead for this year’s ‘Ploughing’ in Ballintrane, Fenagh, Co Carlow from September 17th to 19th. There was huge enthusiasm and positivity from the floor in anticipation of this year’s event. Current World Ploughing Conventional Champion, Garryhill local Eamonn Tracey opened the meeting and welcomed all attendees. NPA Assistant Managing Director Anna Marie McHugh gave an overview of the NPA, the voluntary association and the sheer scale & scope of the event itself. Anna May McMugh, NPA MD said “we are grateful to all the landowners we have met and sincerely look forward to working with the Carlow people, whose support to date has been outstanding.” There are 24 landowners involved locally with 930 available acres. Superintendent Aidan Brennan of Carlow said it is a huge event to come to Carlow and he was delighted to have it and to work as part of the planning for it. The meeting was told Carlow Tourism will be looking after all accommodation matters and if there are any queries to contact CEO Eileen O’Rourke on 059 9130411. There was no shortage of volunteers keen to get involved such as Carlow Native Margaret Connaughton who will be responsible for the entertainment as she has done for the last six years. Sharon Foley will be this year’s Fashion Show Co-ordinator. Brian Rice will be in charge of the popular Hunt Chase, while Carlow ICA & its President Annette Reddy from Leighlinbridge are already formulating their action-packed programme throughout the 3 days. The Vintage Display will be looked after by IVS & IVETA. Local GAA or sports clubs who would like to do car park stewarding were advised to contact the NPA now as these positions are in hot demand. NPA Manging Director Anna May McHugh said “the meeting was incredible positive as the eagerness and excitement from the volunteers was most welcome and a great sign of what is to come for this year’s National Ploughing Championships.” The next public organising meeting date has yet to be confirmed but will be either the second week of March or the beginning of April.